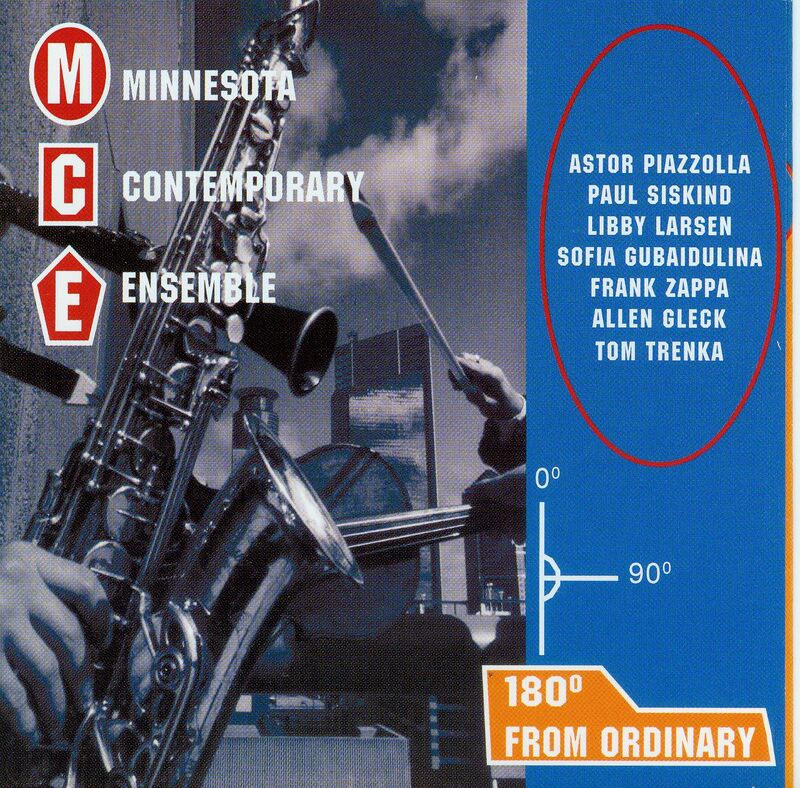 The debut release from the gritty Minnesota Contemporary Ensemble (MCE), known for the energy and vitality of their live performances. 180º from Ordinary features concert recordings made during the first four years of MCE's existence. It includes not only Frank Zappa's The Black Page and Astor Piazzola's Four, for Tango, but also the world premiere recordings of Black Roller by Libby Larsen, Rituale by Paul Siskind, Two Trumpets by Allen Gleck, and watch...wait by Tom Trenka, recipient of the 1997 American Composers Forum Composers Commissioning Program. Founded in 1993, MCE has quickly become recognized as one of the nation's leading new music ensembles. In past projects, MCE has collaborated with John Harbison, Libby Larsen, David Soldier, Lou Harrison, and Zeitgeist. Under Artistic Director Duane Schulthess, the ensemble has performed tours and concerts around the country to critical and public acclaim. "High voltage modern music...no bunny slope jaunt, even sometimes unnerving, but these guys don't shirk the tough stuff." "This young modern music group digs the edgy, abstract."